I came across this article today. I am not sure what point the author is trying to make. Her list of 7 things the middle class can no longer afford strikes me as putting the people who can not afford such things well below middle class. Perhaps my perspective is skewed. Never surrender what you really want for what you want right now. I think this is because we've expanded the term "middle class" to include everyone - including the top 10%. A quick google shows a median household income in the US is $51k. If we assume a household with the median income is middle class - then it starts to make sense. If that's for a family of 4 - then I'd agree that affording all of those things at the same time is rough.... Cars would need to be used, vacations less often, etc. But at least some of those items should be budgeted for. I'm not sure that median household income is the right number to look at as it will include all sorts of people who are living by themselves. Census also produces family income numbers and it's quite a bit higher. E.g. For Illinois the median income for 4 member family is 82k. This is quite a bit higher, but I imagine it would still be tight to do everything on the list. Maybe the Middle Class chooses to spend their money on other things such as smart phones, data plans, private K-12 education, marijuana, maids, yard service, more bathrooms in the house, etc.? This list doesn't match with reality as I see it. I work with a considerable manufacturing group who make no more than $45k, some of them as little as $30k. I see plenty of them taking vacations, getting reasonable medical and dental care, buying new cars and investing in our company 401k. What is the basis for asserting that middle class people can no longer afford these things. What is the basis for asserting that middle class people can no longer afford these things. Not really any basis at all. Guy just had to write a WOW! story. Middle class can't afford all these things at the same time, but plenty can afford several of these things each year. Interesting methodology. Find 7 sources of research showing that the middle class has reduced spending on 7 expenses, and conclude they can't afford any/all of them anymore. Might be that the "middle class" has had to make some choices they might not have long ago, but that does not mean they've had to forego them all. I would guess the middle class folks (who've held on to their careers/jobs) who are having the most trouble would be those who bought way too much house and leverage on same, and can't/won't let go of the house. They probably feel like they can't afford much beyond real or supposed essentials. In my mind I have never been able to afford a new car as I have never had one. It is on my bucket list. Though I will have to be brave. The thought of paying sales tax on $30k plus, higher insurance, and first year impending personal property tax bill makes sky diving a less stressful bucket list item. The article ignores a lot of things in order to bolster the argument. What crap. Dang, we must be upper class! We do all those things! Thanks for the promotion, random opinionated blogger girl! The reason they can't afford 3,4, and 5 is because they piss away all their money on 1 and 2 and all the other toys they're Entitled To. My brother is practically indigent and the Feds and California have given him magnificent medical care and perfunctory dental care, long before ObamaCare was implemented. My grandad used to say "whenever someone is talking about 'helping the middle class', they don't mean you...they mean the people on welfare". One thing that bugs me is how that article mentioned that the average price of a new car these days is around $32,000. That's because people think they *need* a $55,000 half-ton truck or a $40,000 minivan. If you reign it in somewhat, you can get still get a decent car for not a lot of money. A base level midsized car probably wouldn't set you back more than $20-22K these days. And what's "base level" these days is pretty nice. Standard a/c, automatic, power windows, nice stereo, etc. And even with a 4-cyl engine, these cars will put most V-8's of yesteryear to shame. We currently have a society with a large middle class, and smaller populations living in extreme poverty or wealth, a 'diamond-shaped' distribution. This is historically an unusual wealth vs population mix, associated with Demotist systems. Such systems are prone to crashes or failures (France 1793-1794, with their Demotist upheaval, Soviet Union 1934-1940 with the purges, or the USA 1861-1865 with the overthrow of basic property rights). Demotist systems, that is, systems ruled by the “People,” such as Democracy and Communism, are predictably less financially stable than aristocratic systems. On average, they undergo more recessions and hold more debt. They are more susceptible to market crashes. They waste more resources. Each dollar goes further towards improving standard of living for the average person in an aristocratic system than in a Democratic one. 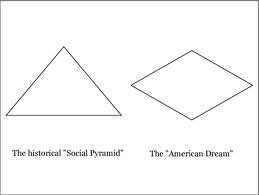 In a society restored to a stable social pyramid, such items that can not be afforded by the base population may be gifted to them from time to time by those higher in the pyramid, as a reward for their efforts in supporting society, via suitable private charities. "Social solidarity, in precise contrast, is the parasite’s friend. By cropping out all high-frequency feedback mechanisms (such as market signals), and replacing them with sluggish, infra-red loops that pass through a centralized forum of ‘general will’, a radically democratized society insulates parasitism from what it does, transforming local, painfully dysfunctional, intolerable, and thus urgently corrected behavior patterns into global, numbed, and chronic socio-political pathologies." USA 1861-1865 with the overthrow of basic property rights). 1861-65, so you mean like slavery? I heard about this "letter to a fellow zillionaire" today on NPR. Its pretty interesting. Its a long read so I just posted the last part of it. Dear 1%ers, many of our fellow citizens are starting to believe that capitalism itself is the problem. I disagree, and I’m sure you do too. Capitalism, when well managed, is the greatest social technology ever invented to create prosperity in human societies. But capitalism left unchecked tends toward concentration and collapse. It can be managed either to benefit the few in the near term or the many in the long term. The work of democracies is to bend it to the latter. That is why investments in the middle class work. And tax breaks for rich people like us don’t. Balancing the power of workers and billionaires by raising the minimum wage isn’t bad for capitalism. It’s an indispensable tool smart capitalists use to make capitalism stable and sustainable. And no one has a bigger stake in that than zillionaires like us. The oldest and most important conflict in human societies is the battle over the concentration of wealth and power. The folks like us at the top have always told those at the bottom that our respective positions are righteous and good for all. Historically, we called that divine right. Today we have trickle-down economics. What nonsense this is. Am I really such a superior person? Do I belong at the center of the moral as well as economic universe? Do you? My family, the Hanauers, started in Germany selling feathers and pillows. They got chased out of Germany by Hitler and ended up in Seattle owning another pillow company. Three generations later, I benefited from that. Then I got as lucky as a person could possibly get in the Internet age by having a buddy in Seattle named Bezos. I look at the average Joe on the street, and I say, “There but for the grace of Jeff go I.” Even the best of us, in the worst of circumstances, are barefoot, standing by a dirt road, selling fruit. We should never forget that, or forget that the United States of America and its middle class made us, rather than the other way around. Or we could sit back, do nothing, enjoy our yachts. And wait for the pitchforks. If you reign it in somewhat, you can get still get a decent car for not a lot of money. A base level midsized car probably wouldn't set you back more than $20-22K these days. The new Honda Accord we bought last December was a hair over $23k out the door and that wasn't even the base model, but one up from it. We wanted the electric seat that would move more than fore & aft for DW's back issues. We haven't been on a vacation in quite a while but apathy is the primary reason for that. Besides, I'm retired so every day is a vacation day anyway. Paying off debt? What is this "debt" thing they speak of? Emergency savings? Yup, I could write a check for a $50k pickup truck, but why? The 12-year-old one I have runs just fine. Retirement accounts, medical care, dental care, done, done, and done. Range of "middle" is too subjective for this kind of article to be spot on. I tend to ignore this kind of article. Can average people in this forum relate to the article & where the author is coming from? Most folks in this forum seem to be multi-millionaires who can (and have been for some time) afford everything in the list. I'd simply say that these are hopefully not ordered in terms of her priorities. Because if you indulge in the first two wants, you'll have little left for the remaining needs. Yes, I think the middle class is getting squeezed and real wages are not keeping up with the cost of living, but I also think there's a lot of "leakage" in a typical middle class budget. Twenty here, fifty there, and the end of the month your "how did my money go here" budget is larger than most of the others.